Rick Egan | The Salt Lake Tribune Utah Valley Wolverines head coach Mark Pope smiles as he leaves the locker room, after soaking his team with water, after the Wolverines 75-71 victory over the Texas-San Antonio Roadrunners, in Orem, Saturday, December 3, 2016. Provo • For the first time since he hired longtime assistant Dave Rose to succeed Steve Cleveland prior to the 2005-06 season, BYU athletic director Tom Holmoe has a basketball coaching search on his hands. Rose, 61, is expected to announce his retirement on Tuesday at a 1 p.m. news conference in the Marriott Center. Holmoe’s search will be narrow, considering head coaches at BYU — which is owned and operated by The Church of Jesus Christ of Latter-day Saints — must be members of that faith. Holmoe stated that unequivocally in December of 2015 when football coach Bronco Mendenhall left for Virginia. The search will also likely be short. Deputy Athletic Director Brian Santiago, who oversees men’s basketball at BYU, will also likely be involved in the hiring process. Reports have already surfaced that Utah Valley University coach Mark Pope, a former BYU assistant under Rose from 2011-15, has been offered the job. The Salt Lake Tribune has not been able to confirm those reports. 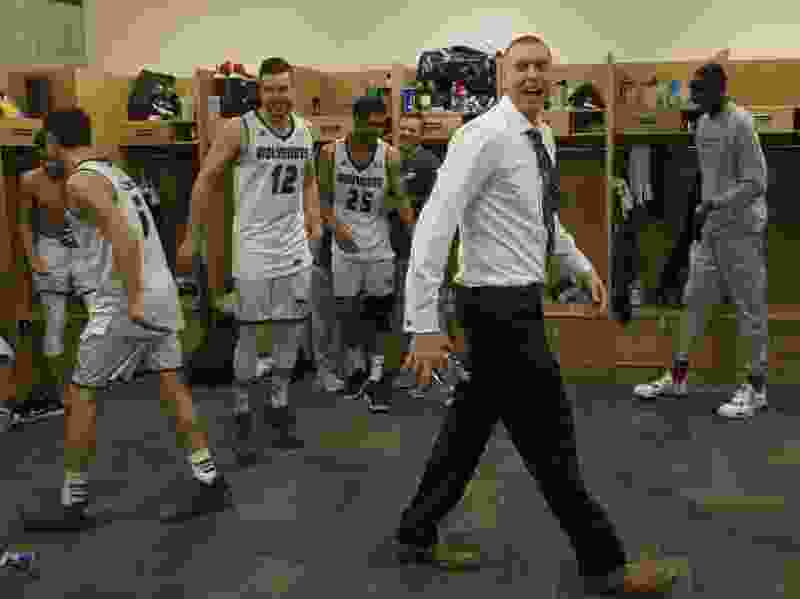 Utah Valley’s season ended Monday night when it lost 66-57 to South Florida in a College Basketball Invitational second-round game in Tampa, Fla.
Pope, 46, led the Wolverines to a school-record 25 wins this past season, and coached UVU to a 114-101 win over BYU in November of 2-16. Pope is married to Lee Anne Archibald, daughter of former University of Utah coach Lynn Archibald, and the couple has four daughters. Pope is 77-56 in four years at UVU; The Wolverines placed second in the WAC to New Mexico State the past two seasons. The job is likely his if he wants it. Another head Division I college basketball coach who is LDS and may be interested is Barret Peery, currently head coach at Portland State. Peery is from Payson, Utah, and played college basketball at Snow College and Southern Utah University and has been an assistant at SUU, Utah Valley, Snow College and the University of Utah. Dixie State University men’s basketball coach Jon Judkins, brother of highly successful BYU women’s coach Jeff Judkins, is also considered a candidate. Dixie State went 18-9 this past season, and Jon Judkins has compiled a 262-126 record at the St. George school. He was Snow College’s coach for 12 seasons prior too leaving Ephraim for St. George. An emotional Dave Rose steps down after 14 years leading the BYU men’s basketball team. His program leveled off in recent seasons, but he leaves as the school’s winningest coach. Would Jeff Judkins be interested? He told The Tribune last year that “that ship has probably sailed,” when he was asked if he would ever consider moving offices in the Marriott Center Annex. Los Angeles Lakers assistant coach Mark “Mad Dog” Madsen, 43, has expressed interest in coaching at BYU in the past and interviewed for the assistant coaching job last year that went to former BYU standout Lee Cummard. Some BYU boosters are pushing for Utah Jazz assistant Alex Jensen, a former head coach in the NBA Developmental League who played for Rick Majerus at Utah and coached under him at Saint Louis. Jensen has never publicly expressed interest in leaving the NBA for a college job, however. Along with Cummard, Rose’s current assistants are Tim LaComb and Quincy Lewis. LaComb joined the program in 2007 as director of operations and became an assistant coach in 2010 and the associate head coach in 2010. Lewis was head coach at Lone Peak High from 2003-15 and joined Rose’s staff in 2015 as an assistant coach. The new coach will be charged with reviving a fanbase that declined precipitously in 2018-19. The Cougars averaged 11,958 in 16 home games this season, 29th-best in the country, but 2,362 fewer fans per game than last season. It was their lowest home attendance since the 2005-06 season, Rose’s first year. Many programs around college basketball have experienced drop-offs in attendance, but few that drastic in a single year.